There aren't any real advantages to using nitrogen in a street tire. Enough time has gone by, and enough research has been done, to be able to back up what effect using nitrogen has as an inflation medium. Rather than repeat the myths surrounding nitrogen as an inflation medium - thereby reinforcing the myth - then refute them - I am going to state the propositions as positive statements and show why they are true. Nitrogen - as an inflation medium - reacts very similarly to air. It expands when heated. It leaks out of tires. Air is 78% nitrogen. So you'd expect air to react very similarly to nitrogen simply because it is mostly that one gas. Just for the record, air is also about 21% oxygen, about 1% argon, with very small percentages of other gases. n = the number of molecules of the gas - commonly expressed as "moles". In a tire, the volume is determined by the size of the tire. So it is constant so long as the tire is static. When a tire rolls, it is subject to centrufugal forces and grows, but the growth is small compared to the overall diameter, so for the purposes of this discussion, can be discounted. Also, the difference in volume between a loaded and unloaded (or free-standing) tire is small. I have measured the difference using a very precise gauge and it is between 0.1 psi and 0.5 psi, depending on how heavily loaded the tire is. Again, for the purposes of this discussion, I will assume the loading doesn't change. For the purposes of this discussion, the volume is constant. Notice that there is no part of this equation that is unique to either nitrogen or air. In other words, the equation is valid independent of the gas involved. Hint! For those who are going to do the calculation, the equation is in terms of both absolute pressure (which means you have to add 14.7 psi to the inflation - gauge - pressure) and adjust the temperature to the absolute scale (that is use the Rankine scale by adding 460° to the Farenheit temperature) for the calculation to work properly. So that's the theory. How does that work in practice? Is there something that shows this is actually what happens? 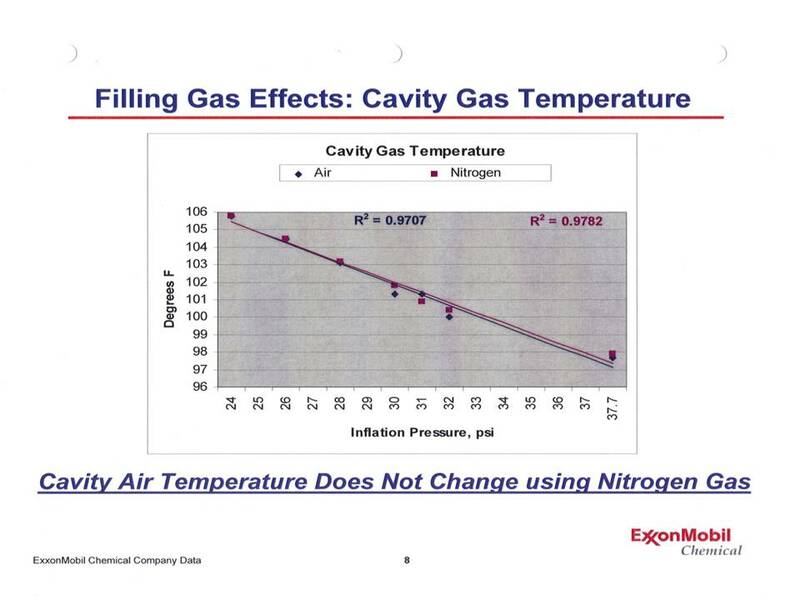 Below is a graph presented June 4, 2008 by Dr. Walter Waddell of ExxonMobil to the California Air Resources Board. This shows the effect of operating a tire with various inflation pressures for both air and nitrogen. Notice that the points lie practically on top of another - and when a best fit straight line is calculated, not only do those lines lie on top of one another, but the r2 values (a measure of how close a line fits the data points) is over 97% - an excellent fit! 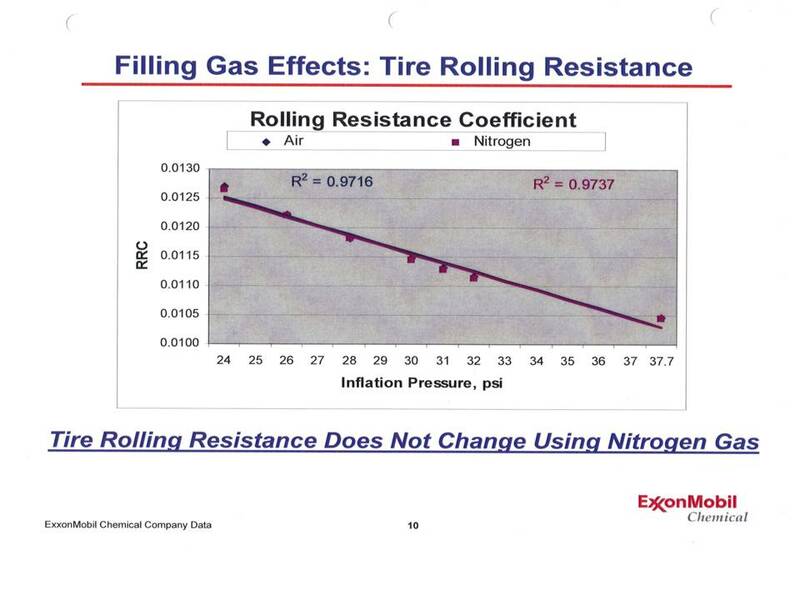 To add more depth to this, Dr Waddell also presented a graph showing the rolling resistance of a tire at various inflation pressures for both nitrogen and air. In other words, rolling resistance - which is very sensitive to inflation pressure - was not different between the 2 gases. By extension, I think it is obvious that any other tire property would be unaffected by the use of nitrogen - by itself. As a tire engineer, this is exactly as I would expect: It doesn't matter what gas is used to inflate the tire, the tire's behavior doesn't change. 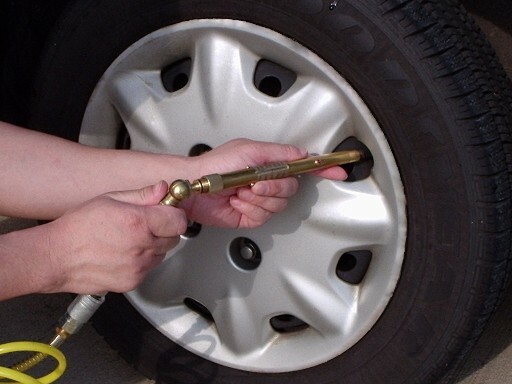 Put another way, there is nothing about the gas used to inflate a tire that has an effect on how a tire behaves. Also, I am not aware of any studies that looked at treadwear. ride, traction, noise, etc. in a tightly controlled situation where nitrogen was the only item allowed to vary. What studies I have seen on those properties have typically been fleet studies, where it is very difficult to control variables - so they don't. Many of these studies take advantage of nitrogen's lower leak rate - and then claim the effect is the result of nitrogen by itself. I think these studies are not quite honest in their assessment. So what about the other thing I said: Nitrogen leaks out of tires. They found that tires filled with simple air lost 3.5 psi over a year, while the tires inflated with nitrogen lost 2.2 psi. While that was a difference of 1.3 psi in favor of nitrogen (37%), that is not a lot of pressure difference - and more importantly, there was loss for both gases. A rule of thumb is that for every 10°F, the tire's pressure will change 1 psi. That means that from the summer's high of 90°F to winter's 0°F, the pressure in your tire will drop 9 psi - DANGEROUSLY underinflated! This will happen no matter what gas is used as an inflation medium. What about oxygen's affect on a tire? Doesn't nitrogen prevent tire aging? There is a principle called the Law of Partial Pressure of Gases. 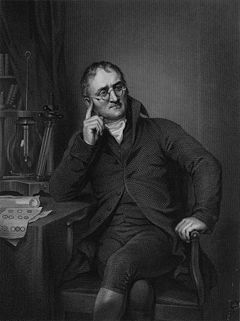 Sometimes this is referred to as Dalton's Law after John Dalton (pictured), who discovered the principle. It states that a mxture of gases behaves like each gas is working independently - and you can separate the effects the various gases have by using their percentage in the mixture as the same as their percentage of the gas. 14.7 X 0.78 = 11.5 psi. For tires, it means that pressurized air within a permeable membrane (the tire itself) will diffuse (lose pressure) through the tire according to the diffusion rate of each gas individually. So if oxygen has a different diffusion rate that nitrogen (it does - oxygen diffuses more quickly! ), then the amount of oxygen available to attack the rubber is also increased. One might think that inflating a tire with 100% pure nitrogen would prevent oxygen from ever reaching the critical parts of the tire - the belt edges! Unfortunately, the Law of Partial Pressure of Gases also works in reverse. In spite of the nitrogen being under pressure, the oxygen in the atmosphere is under pressure compared to the oxygen inside the tire. Put another way, if there is 100% nitrogen in a tire - and therefore no partial pressure of oxygen - then the partial pressure of oxygen outside the tires is 14.7 psi X 0.21 (21%) = 3.1 psi. That means that there is a pressure of 3.1 psi trying to push oxygen into the tire. This effect was demonstrated by a paper delivered to Tire Society, Sept 25, 2007 by Don Amos - Study of Oxygen and Nitrogen Permeation through Tires with Monthly Top-off. Unfortunately, this paper was never published. Also unfortunately, when oxygen attacks rubber, the oxygen is combined with other materials. Some of these are gases. Some are not. But it doesn't matter, the oxygen is used up, so it gets replaced by other oxygen (That pesky partial pressure thing!). The net effect is that the effects of oxygen will take place regardless of what is used to inflate the tire - and while air starts off with excess oxygen, that will eventually reach a pressure equilibrium. What about the fact that nitrogen is supposed to be free of water? Air obviously has humidity – water vapor. Air’s ability to hold water as a vapor depends on both the temperature and the pressure. You can experience one of these relationships as fog in the morning – or as moisture (dew) that is on your car when you get ready to go to work. You can also "see" water vapor in a spectacular way when a plane breaks the sound barrier. As the temperature drops, air’s ability to hold moisture in suspension also drops. This is not a problem until the air reaches 100% humidity (The dew point). At that temperature, the water vapor changes to liquid water. Needless to say, water vapor occupies more space than liquid water, so the partial pressure due to water vapor also drops. But the same thing happens if you compress air – once the air is saturated (reaches 100% humidity), the water condenses out. When this happens in an air compressor, water forms on the bottom of the holding tank – which is why you are supposed to periodically drain the tank. However, when you use the compressed air, you are using at less than tank pressure, so water condensing is not a problem. Let's assume there is a compressed air tank at 100 psi, 100% humidity, and 70°F. That air is going to be added to a tire at 35 psi. Does the water vapor condense out? NO! The dew point of air at 35 psi is 47°F. But to complicate this further, the air lines – while having the same pressure as the tank – can be subjected to lower temperatures, and water will condense in the line. To prevent this water from entering the tool – or whatever the compressed air is being injected into – it is common (and recommended) that any regulator (a device that reduces the line pressure) include an air filter with a bowl for collecting condensate (there’s more than just water!) and that the bowl be purged regularly. So when inflating a tire, this should prevent liquid water from forming in the tire. But is liquid water in a tire really a problem? Say we mount a tire with standing water in it, (It was sitting out in the rain! ), does this hurt the performance of the tire? 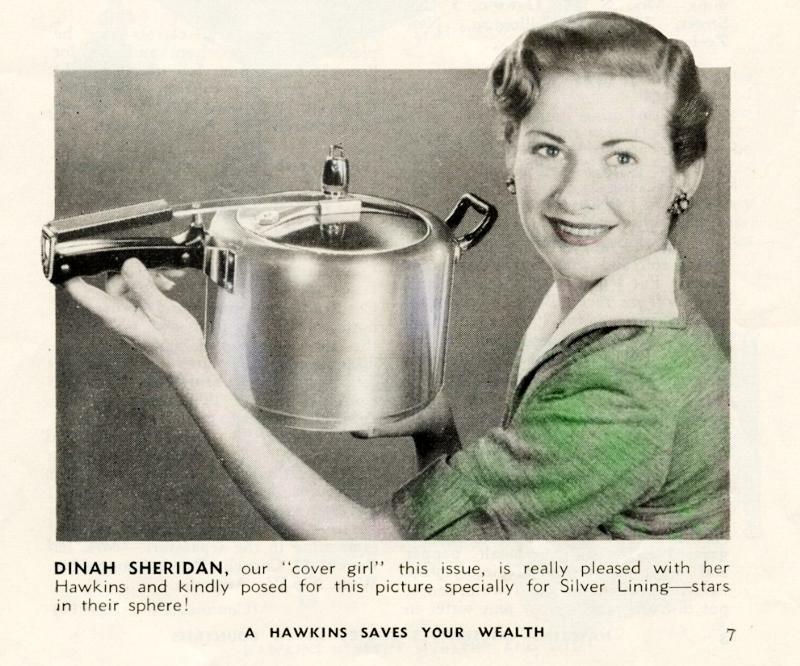 This is the principle behind pressure cookers. The increased pressure increases the temperature at which water boils. The boiling point of water at 30 psi is 273°F! That’s well beyond any temperature seen in a street tire. So there isn't going to be a sudden spike in pressure when the tire is operated. Besides a few psi more is of no real consequence in a street tire. – and if you are racing, that is a whole different kettle of fish. But even under the severe conditions encountered in racing, the air chamber will not reach these kinds of temperatures. Nevertheless, the spring rate of a tire is dependent on the inflation pressure - and changes in spring rates can affect the handling characteristics of a tire. Recognizing that it takes a trained person suich as a race car driver to detect these changes, it becomes important in racing to minimize the effect temperature has on the inflation pressure. Obviously, water in a tire creates a whole bunch of other peculiar situations, so let’s talk about each one individually. Rim corrosion: Alloy wheels don’t really have a problem with water inside the tire. They are coated to keep aluminum from forming aluminum oxide, which forms a crust, which isn't very attractive. But even then, this crust protects the aluminum from further corrosion from the water.Where they have problems is where the alloy contacts steel – like the spring clip used on wheel weights – particularly where salt is present. But this problem is totally independent of the inflation gas. Steel wheels only have a problem if the paint is damaged. For practical purposes this is not an issue either. In summary: There aren't any real advantages to using nitrogen in a street tire.